Back by citywide demand! Chicago Shakespeare in the Parks returns this summer and brings William Shakespeare's A Midsummer Night's Dream, FREE FOR ALL, to 18 neighborhood parks across Chicago. As in previous years, a specially equipped truck will roll into each park, a stage will unfold, and a company of professional actors will share the delight of Shakespeare with families and neighbors of all ages. In this popular Shakespearean comedy, a quartet of mismatched lovers, a gaggle of hapless actors and mischievous sprites cross paths with the king and queen of the fairies, entangled in their own domestic dispute. Audiences will be transported to a wondrous wood brimming with paramours and possibilities where the inexplicable magic of falling in love—and the marvel of waking up from the sweetest of dreams—is discovered. Director David H. Bell has adapted this Shakespeare favorite into an acrobatic and riotously entertaining version of the play. Touring to parks across the City, the free Shakespeare performances activate neighborhoods, attract families, break down barriers and build community partnerships. Now in its third season, Chicago Shakespeare in the Parks is one of the city's most celebrated summer traditions. 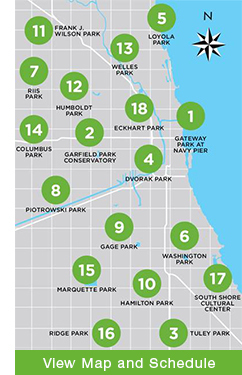 See where Chicago Shakespeare in the Parks 2014 took place in the city. Read a short summary of this year's Chicago Shakespeare in the Parks and find out why this play is the Bard’s most magical comedy. This educational piece provides information on William Shakespeare, the history of dreams, an interview with director David H. Bell, and much more. Cast member Tiffany Yvonne Cox talks about the work of Shakespeare and what it’s like to tour around the city with Chicago Shakespeare in the Park.